The words have been repeated from Tunisia to Egypt, from Yemen to Bahrain. "The people want the regime to fall"  the mantra of revolution. And so, last week, after 15 kids wrote those words on a wall in the agricultural town of Dara'a in southern Syria, the local governor decided to come down hard. The young people  all under 17  were thrown in jail. The punishment stunned the town, and suddenly, Syria  so confidently authoritarian  got its first strong taste of rebellion in the Arab Spring. Syria remains a closed and walled-off nation. But descriptions of the uprising in Dara'a are dramatic. The alleged details include dozens of young men pelting a poster  in broad daylight  of a smiling President Bashar Assad; the demolition of a statue of the President's late father and predecessor Hafiz Assad; the burning of official buildings, including the ruling Baath Party's headquarters and the governor's office. "There is no fear, there is no fear, after today there is no fear!" hundreds of men chanted in shaky mobile-phone footage allegedly from Monday. Over the weekend, provincial security forces opened fire on marchers, killing several. Assad responded immediately, sending a high-ranking delegation to deliver his condolences to the families of the dead. The governor was cashiered, and the 15 kids released. But according to at least two dissident websites, protesters have given the Syrian government until the morning of March 25 to meet a list of demands that were relayed to the President by his delegation. If the demands are not met, they threaten, March 25 will become the "Friday of the Martyrs" not just in Dara'a and its province, Hauran, which shares a border with Jordan, but throughout the country. Assad is unlikely to meet demands that include lifting the 48-year-old emergency law and releasing all political prisoners. But the government has agreed to set up a committee to investigate the deaths of the five people who were reportedly killed. The protesters are also demanding an end to pervasive corruption and an amendment to a real estate law governing property transactions in border areas. Protesters, who were continuing to demonstrate  though less vociferously  on Tuesday, have renamed the public space in front of Dara'a's Omari Mosque "Dignity Square"  dignity being another theme of the revolutions in the region. But the government has sought to downplay the unrest, blaming it on Jund as-Sham, an obscure fundamentalist group with links to al-Qaeda, and Fatah al-Islam, another Islamist outfit, which was routed by the Lebanese army in a months-long standoff at the Nahr al-Bared Palestinian refugee camp back in 2007. In a front-page story in the government-run Teshreen daily on Tuesday, Dara'a cleric Sheik Ahmad al-Sayasina was quoted as saying, "There were elements from outside Dara'a determined to burn and destroy public property ... These unknown assailants want to harm the reputation of the sons of Hauran." 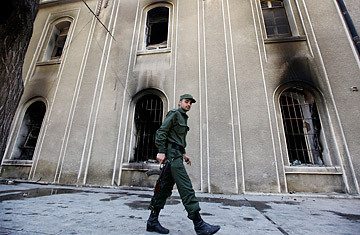 The cleric reportedly said, "The people of Dara'a affirm that recent events are not part of their tradition or custom." Protests have been reported in several other regions, including Banias, Qamishli, Douma, Deir ez-Zor and the capital, Damascus. "It's difficult to contain this," says Radwan Ziadeh, a Washington-based Syrian dissident and visiting scholar at the Institute for Middle East Studies at George Washington University. "It will take time, but they are chipping away at the barrier of fear." Of crucial importance, Ziadeh says, is the fact that the uprising did not begin in the long-suffering Kurdish north, providing the regime with an easy excuse to clamp down on the region's stateless Kurds, nor in Hama or Aleppo, where the banned Muslim Brotherhood has strong underground support. Rather, it happened in what is essentially Anytown, Syria. But Hauran has one distinction. The commanders of at least three of the 10 divisions of Syria's 240,000-strong army hail from the province as well as a significant number of senior officers, making it highly unlikely that they would engage in violence against people from their own tribal areas. Because of this, the Republican Guard, which is fiercely loyal to the President, is now in Dara'a, Ziadeh says. "The security forces have to be careful not to be too violent or to attempt to crush this, because it can easily backfire on them," he says, and in the worst-case scenario, it could lead to military defections. "It's a very tense situation," says a source within Syria who requested anonymity. "I think now we're seeing something of a grace period where the government is promising to act and the people are willing to give them the benefit of the doubt  which will last for a day or two  not more." Assad, like his father, has surrounded himself with members of his fellow minority Alawite sect (the majority of Syrians are Sunni). He has nevertheless been a clever, strong and wily leader. But that was before these youth-led revolts rocked the region. Now he may face his toughest test yet. Will he survive? What happens in Dara'a on March 25 will be key.